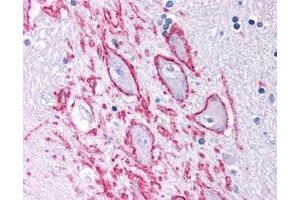 Staining of brain, basal nucleus of meynert, neurons using ABIN152468. Western Blot: Neurokinin 1 Receptor Antibody [ABIN152468] - Analysis of Neurokinin 1 Receptor in 1. human brain lysate, 2. rat brain lysate and 3. monkey brain lysate. 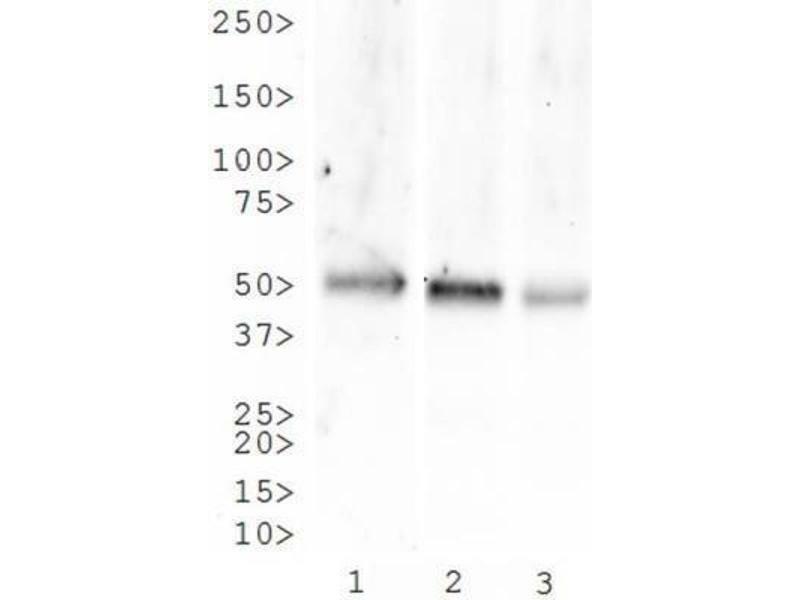 Western Blot: NK1R Antibody [ABIN152468] - Total protein from human, mouse and rat brain was separated on a 12% gel by SDS-PAGE, transferred to PVDF membrane and blocked in 5% non-fat milk in TBST. 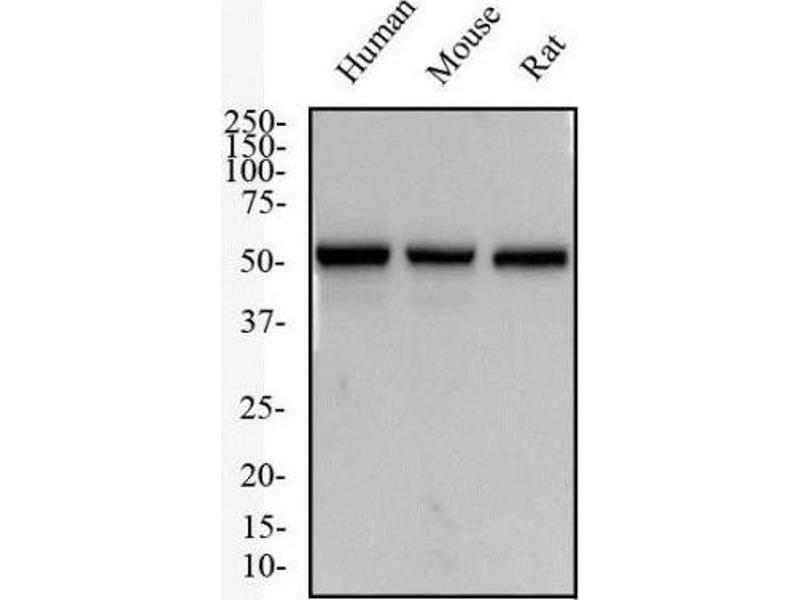 The membrane was probed with 2.0 ug/ml anti-NK1R in 1% non-fat milk in TBST and detected with an anti-rabbit HRP secondary antibody using chemiluminescence. 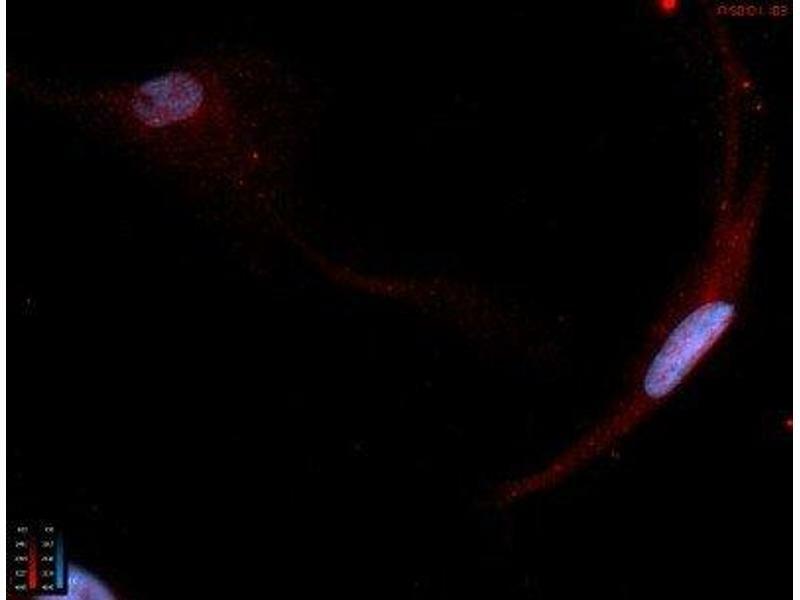 Immunocytochemistry/Immunofluorescence: Neurokinin 1 Receptor Antibody [ABIN152468] - Immunostain of NK1R in rat enteric glial cells. Image courtesy of anonymous customer review. Application Notes Western Blot 1-2 μg/mL, Flow Cytometry 1:10-1:1000, Immunohistochemistry 10 μg/mL, Immunocytochemistry/Immunofluorescence 1:100, Immunohistochemistry-Paraffin 10 μg/mLThis Neurokinin 1 Receptor Antibody is useful for Flow Cytometry, Immunocytochemistry/Immunofluorescence, Immunohistochemistry and Western blot. The observed molecular weight of the protein may vary from the listed predicted molecular weight due to post translational modifications, post translation cleavages, relative charges, and other experimental factors. 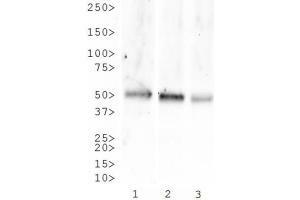 Protocol Protocol specific for Neurokinin 1 Receptor Antibody Western Analysis1) Separate 50 µg of whole cell or membrane protein on a 4-20 % Tris-glycine gel. 2) Transfer the proteins from the gel onto a nitrocellulose membrane.
) Incubate the nitrocellulose membrane in Blocking solution [5 % non-fat dry milk / PBS] overnight at 4 degrees C.
) Incubate the membrane with a 1:1,000 dilution of anti-NK-1 antibody (Novus Biologicals, Inc, #NB300-119) in PBST-NFDM [PBS / 0.1 % Tween-20 / 5 % non-fat dry milk] for 2 hours at RT.
) Wash the membrane with PBST-NFDM.
) Incubate the membrane with HRP-conjugated goat anti-rabbit IgG diluted with PBST-NFDM for 1 hour at RT. 1. Seed cells into small (T-25) flask. Add 5-10 mL media. 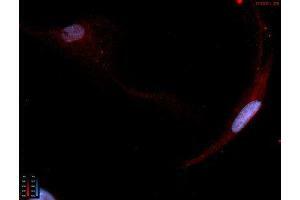 Allow cells to grow to 80-100 % confluence.
. When flasks are confluent, empty media and add new media containing appropriate drug, hormone, or cytokine dose.
. Allow flasks to incubate for 24 hours. After incubation period, remove 2 mL of media and place 1 mL into one of two eppendorf tubes.
. Empty off remaining media. Wash with 5 mL 1X PBS.
. Add 2 mL PBS with azide (1 % Goat serum).
. Scrape cells using a cell scraper.
. Incubate on ice for - hour in the PBS with azide (1 % Goat serum). Vortex all tubes after incubation.
. Centrifuge at 1400 RPM for 5 minutes. Empty off media.
. Resuspend in 1 mL of a 1:3,000 primary antibody solution [1 µL antibody per 3 mL PBS with azide (1 % Goat serum)].
. Incubate on ice for 1 hour. Vortex all tubes after incubation.
. Centrifuge at 1400 RPM for 5 minutes. Aspirate (or decant) supernatant.
. Wash twice with 2 mL ice-cold PBS with azide (1 % Goat serum).
. Aspirate (or decant) supernatant and place tubes on ice.
. Resuspend in 1 mL of a 1:500 secondary antibody solution [2 µL antibody per 1 mL PBS with azide (1 % Goat serum)].
. Cover with foil. Incubate for 30 minutes on ice.
. Vortex after incubation. Centrifuge at 1400 RPM for 5 minutes.
. Aspirate (or decant) supernatant. Wash twice with 2 mL ice-cold PBS with azide (1 % Goat serum).
. Aspirate (or decant) supernatant. 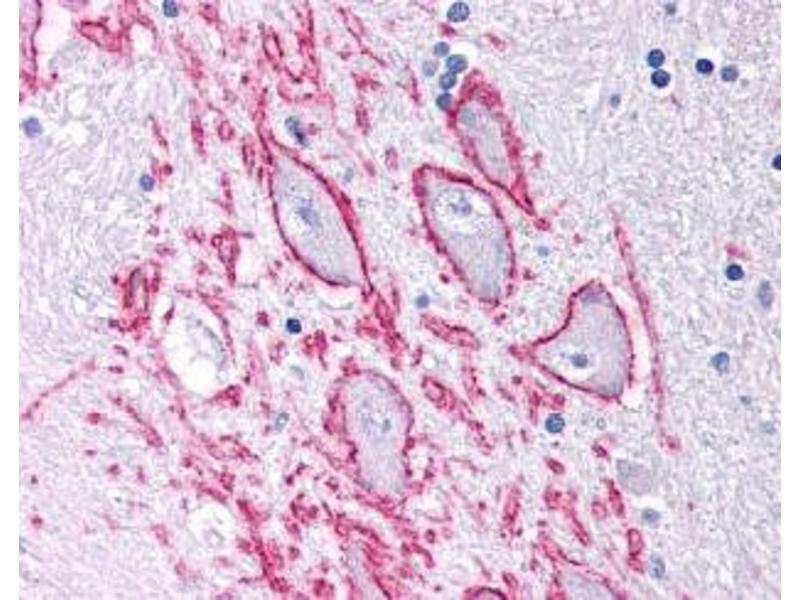 Resuspend in 2 % paraformaldehyde.
. Read on flow.FACS Analysis procedure courtesy of: Rosalyn Blumenthal, Ph.D. Director Tumor Biology Garden State Cancer Center Belleville, NJ 07109IHC-FFPE sectionsI. Deparaffinization:A. Treat slides with Xylene: 3 changes for 5 minutes each. Drain slides for 10 seconds between changes.B. Treat slides with 100 % Reagent Alcohol: 3 changes for 5 minutes each. Drain slides for 10 seconds between changes.II. Quench Endogenous Peroxidase:A. Place slides in peroxidase quenching solution: 15-30 minutes.To Prepare 200 mL of Quenching Solution:Add 3 mL of 30 % Hydrogen Peroxide to 200 mL of Methanol.Use within 4 hours of preparationB. Place slides in distilled water: 2 changes for 2 minutes each. Li, Wu, Yang, Zhang, He, Xu, Zhang, Tao, Luo: "Tachykinin NK1 receptor antagonist L-733,060 and substance P deletion exert neuroprotection through inhibiting oxidative stress and cell death after traumatic brain injury in mice." in: The international journal of biochemistry & cell biology, Vol. 107, pp. 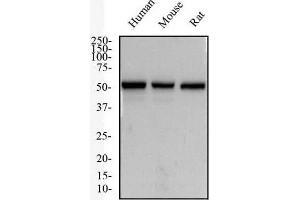 154-165, 2019 Method employed by authors: Western Blotting (WB) (Sample species: Mouse (Murine)). Zhang, Zheng, Xie, Chai, Wang, Zhang, He: "Up-regulated expression of substance P in CD8(+) T cells and NK1R on monocytes of atopic dermatitis." in: Journal of translational medicine, Vol. 15, Issue 1, pp. 93, 2017 (Sample species: Mouse (Murine)). Henssen, Odersky, Szymansky, Seiler, Althoff, Beckers, Speleman, Schäfers, De Preter, Astrahanseff, Struck, Schramm, Eggert, Bergmann, Schulte: "Targeting tachykinin receptors in neuroblastoma." in: Oncotarget, Vol. 8, Issue 1, pp. 430-443, 2016 Method employed by authors: Western Blotting (WB) (Sample species: Human). Grimsholm, Rantapää-Dahlqvist, Dalén, Forsgren et al. : "Observations favouring the occurrence of local production and marked effects of bombesin/gastrin-releasing peptide in the synovial tissue of the human knee joint--comparisons with substance P and the ..." in: Neuropeptides, Vol. 42, Issue 2, pp. 133-45, 2008 (Sample species: Human). Andersson, Danielson, Alfredson, Forsgren: "Presence of substance P and the neurokinin-1 receptor in tenocytes of the human Achilles tendon." in: Regulatory peptides, Vol. 150, Issue 1-3, pp. 81-7, 2008 (Sample species: Human). Massouh, Wallman, Pourcher, Parent: "The fate of the large striatal interneurons expressing calretinin in Huntington's disease." in: Neuroscience research, Vol. 62, Issue 4, pp. 216-24, 2008 (Sample species: Human).